Educate Destitute Girls in Kolkata, India. This project empowers girls from very poor families to avoid early marriage and a life of extreme poverty, illiteracy, childbearing, abuse and drudgery. A sponsored girl remains in school and goes on to further education or vocational training. Educated and with financial independence she can delay marriage, is empowered to make decisions for herself and to support herself and her family. To be born poor and female in India is to have a very bad start in life: between ages 1 and 4 girls have a 61% higher mortality rate than boys; the school drop out rate in adolescent girls is 63.5%; and 45% of girls in India marry before the age of 18. 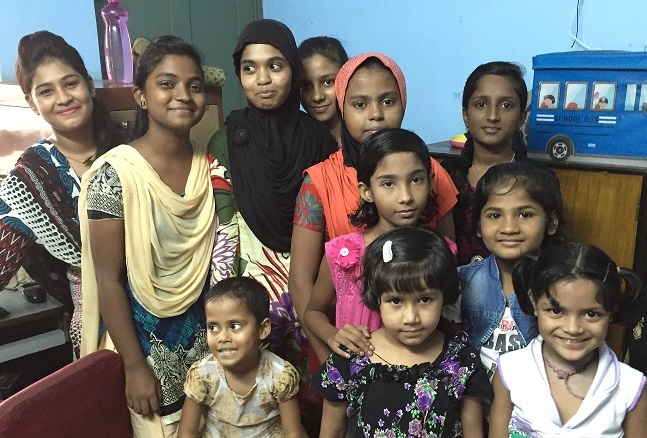 These 15 girls are from very poor families and all are in danger of dropping out of education and being married off early – only to perpetuate the cycle of drudgery, childbirth and illiteracy suffered by their own mothers. To be a sponsored girl means she will remain in education. She’ll receive all the necessary additional tuition to help her gain qualifications. Her books, uniform and stationery will be supplied. She’ll have health care, computer training, dance lessons and educational outings. She will have access to our own girls’ library and resource centre and she’ll be monitored and mentored by our staff. Her family receive a small monthly stipend. She’ll be proud to be a sponsored girl. By staying in education a sponsored girl gains the qualifications she needs to become financially independent. With economic power comes the ability to make life choices for herself. She can delay or even decide against marriage. She can earn a living and build up her savings. She is in control of her health and can make informed and healthy choices for her own children. Our sponsored girls from the last 20 years are pillars of the community and a shining example to the rest.